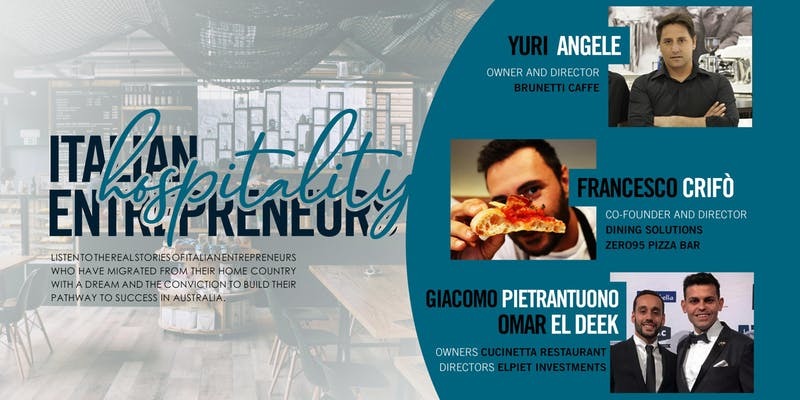 Get inspired by the stories of Italian Hospitality Entrepreneurs who come together for this amazing business networking event. Join us for some insightful presentations and discussion with key players in the Hospitality Business field. In 1991, Giorgio Angele bought the single store business in Carlton from his friend Piero Brunetti. Yuri Angele took over the family business which is nowadays a real empire, with different restaurants and cafes around Melbourne, including Tullamarine Airport and a 300 seats restaurant in Flinders lane. Yuri is now working to take it to the next level. Francesco was born in Catania, Sicily, a port town that sits on the Ionian Sea, between Sicily and Greece. Thus, he grew up in a restaurant family, and since the age of 15, he’s a pizza maker. As the years passed, he won many local and European pizza competitions, became a Pizza Master at a famous European pizza school, and have led many students into excellence through his teaching. He then moved to Melbourne and after some years opened Zero 95 Pizza Bar, to bring the fresh flavors of Italy to the bright beaches of Melbourne. After only a year, they participated in the World Pizza Challenge in Naples, and his partner, Andrea, won World’s Best Pizza. Students came from all over the world to learn to make pizza from them. They’ve since opened two pizzerias: Six Slices Pizza Bar, Express Pizza and Pasta and also opened Meno Zero Gelato and Dessert Bar. They are among the top five pizzerias in Victoria. Omar and Giacomo broke the Million Dollars in sales in the 1st 12 months in business with Cucinetta Restaurant. The restaurant reached position number 2 out of 4000 restaurants in Melbourne on Trip Advisor after 21 months of operation. They were nominated among the finalists for 2018 Best Young Entrepreneurs of the year by the Italian Chamber of Commerce and Industry. They attended the prestigious Tony Robbins Master University and were mentored by business and marketing guru Kerwin Rae. They also are K2 Elite Members (one of the most successful business association of entrepreneurs).